If you are contemplating for the first time to be a volunteer in an archaeology field school, this course could be right for you. This program accommodates participants with or without previous experience. You can learn from the beginning excavation techniques and methodology. During the excavation you will find archaeological remains from the classical period including Roman pottery, amphora, glass, etc. that you will learn how to identify in the laboratory. 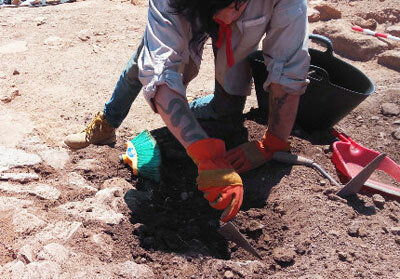 This is the most economical course that The Sanisera Field School offers. The excavation takes place on the northern coast of the island, surrounded by the sea and pristine Mediterranean landscapes. The fieldwork focuses on Classical Archaeology, and specifically on Roman archaeology. It runs 7 hours a day, and is divided between excavation, lab work, exercises, lectures and excursions. Students receive an intensive introduction on basic aspects of archaeological excavation techniques (following the Harris Matrix), which are applied during the excavation time. In the laboratory students process, classify and study excavated material as well as attend lectures on the study of Roman archaeology. In addition to the daily excavation and laboratory work, students learn about Roman History through organized excursions. For every six course days, there are two days off. The course is taught in English and Spanish. Next topic: "2019 Digging Anthropology in the Sanisera Necropolis (Menorca, Balearic Islands –Spain-) "
Previous topic: "September-October 2018 Advanced Field Experience in Bioarchaeology"